It’s not the Daniel Fast, but I have got to start eating healthier. I don’t think I can go without dairy while breastfeeding. And I don’t want to go without cheese. And we are still eating the rest of the Istanbuli rice. And I made pesto pizza from white canned pizza dough. But after just half a day of eating whole grains, fruit and vegetables, that chocolate chip cookie didn’t taste like food. So this morning I had peanut butter and banana, and hummus and whole wheat pita for breakfast. 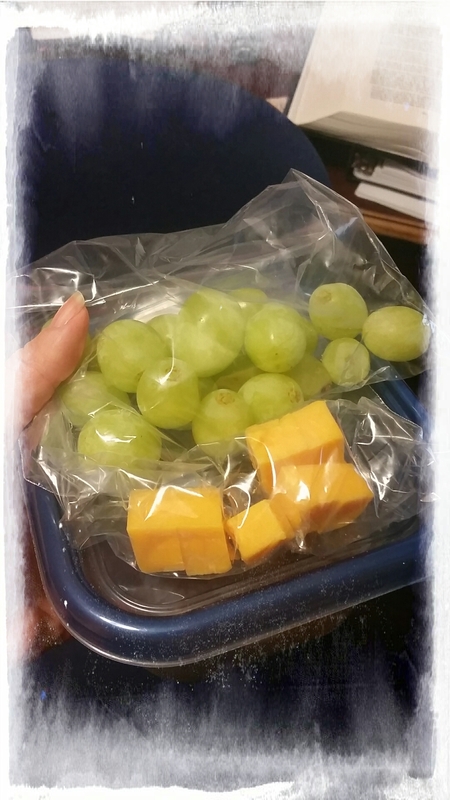 And I have left over rice for lunch, but I also packed cheese, grapes, and nuts for my snack. And if all goes according to plan it will be a vegetarian spaghetti squash dinner. I’m craving healthy foods right now and I’m grateful for that desire. Change is so much easier when it starts with a heart change rather than an action change. Regardless of how badly my colon or my waistline or my baby need healthy food, the easiest way to stick with a meal plan is to crave the foods that are on it.